The Formax Booklet Makers are compact and efficient, they are quick and easy to set up which helps in production of professional quality booklets. 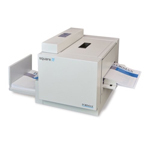 Formax booklet makers can be used anywhere like offices, church, school or even in small print shops. The Formax Makers are capable of programming 6 custom sizes into memory, their LCD panel and push button controls make them easy to use too. Formax booklet makers have automatic operation and time feature with the help of which up to 500 booklets can be created in an hour.